The family of Renata Teodoro sits down for a meal without her. Her sister, Sabrina, brother, Rafael, mother, Gorete, and father, Joel, lived in Brockton, Massachusetts, for 15 years before being deported back to Brazil while Renata continues to live in Boston under the Dream Act. Under the Dream Act, young undocumented immigrants are exempt from deportation for at least two years if their parents brought them illegally into the country as children. Renata, 25, now works legally under a permit and shares an apartment with two other students in Boston. 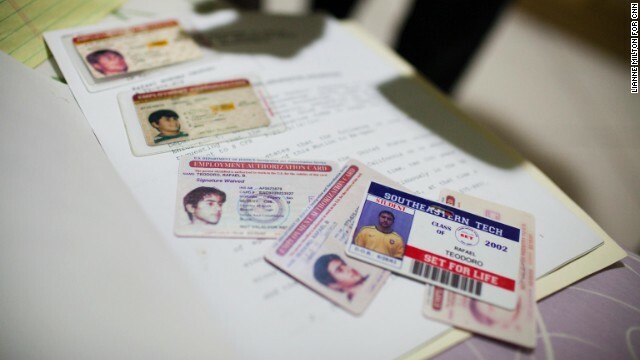 Renata's brother Rafael, 29, shows his U.S. work authorization cards and a high school identification card at his home in Brazil. 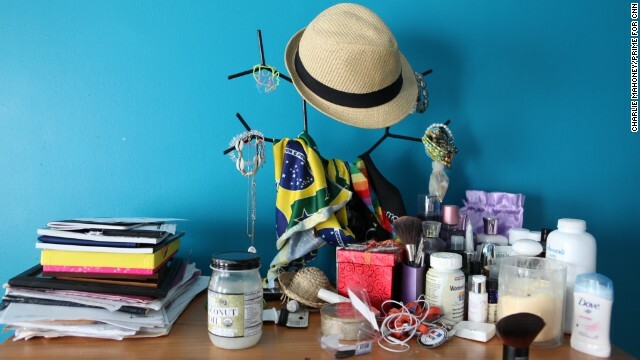 Personal items, make-up and a bandera of the flag of Brazil adorn a dresser in Renata's apartment in Boston. Renata would have to wait five years before she can begin petitioning for her family's return to the United States, but the process could take as long as seven years if an upcoming amendment passes that would further militarize the border. 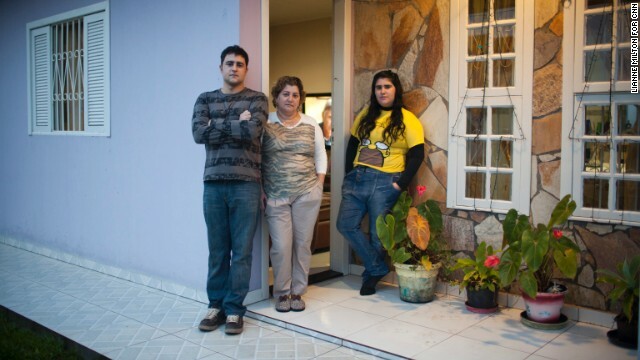 Here her brother, mother and sister pose outside their home in Brazil. Renata prepares for her day by applying makeup in her room in her Boston apartment. 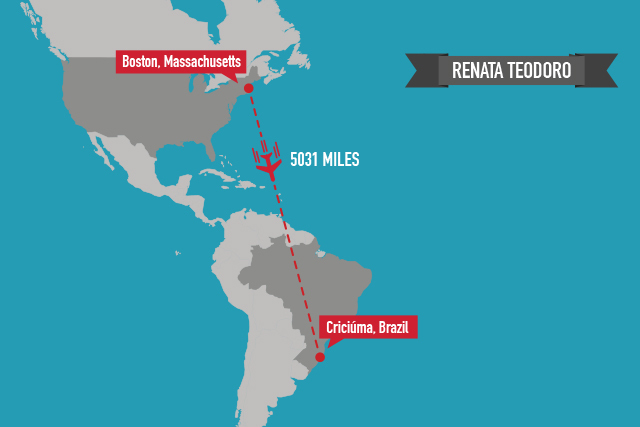 After immigration agents arrested Renata's brother, Rafael, at the family's Boston home in 2007 and deported him, her mother surrendered to authorities, taking Sabrina with her back to Brazil. Here, Raphael at their home in Brazil. 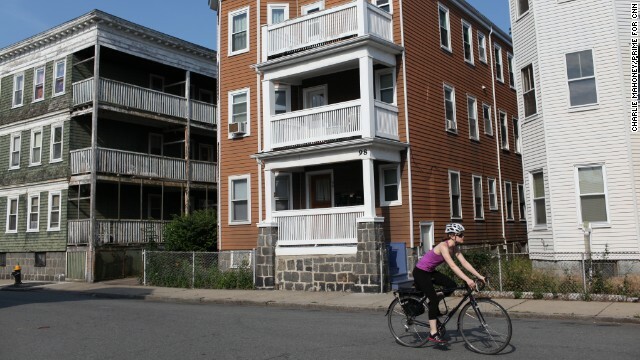 A lone cyclist rides by the apartment building where Renata lives in Boston. 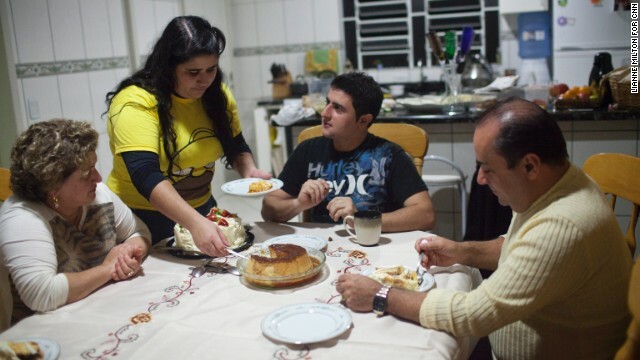 A photograph of Renata at her "festa de quinze anos," a traditional 15-year-old birthday party, at the Teodoro home in Brazil. Renata shows a photo of her with her brother and mother during a birthday party prior to her arrival in the United States. 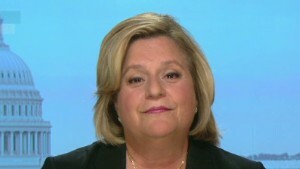 (CNN) -- Renata Teodoro is alone against the world. Everyone in her family has given up on the United States, especially after her mother and brother were deported to Brazil. They want her with them, but the 25-year-old Teodoro can't leave. She's been here since age 6 when her family crossed the border. America is all she knows. She's working herself through the University of Massachusetts, just landed a sweet nonprofit job helping students and feels a great future can be hers -- influencing public policy and the law, her major. It's a dream that just won't die. Not now. Not as Congress considers reforming the nation's broken immigration system to provide a route to citizenship for Teodoro and the country's 11 million other undocumented immigrants -- an overhaul not seen since the landmark amnesty of 1986. Can immigration overhaul pass the House? Next step for immigration overhaul? Teodoro's hopes were boosted last year when President Barack Obama issued an executive order exempting young undocumented immigrants such as herself from deportation for at least two years if their parents brought them illegally into the country as children. She now works legally under a permit and shares a $1,300-a-month apartment with two others in Boston's Dorchester neighborhood. This week, the Senate approved a sweeping bill that would bring that vast population out of an underground-like life, reuniting families such as Teodoro's that have been cleaved by deportations. But even if the measure gets through the Republican-controlled House of Representatives, it won't be the immediate godsend as some may think, Teodoro said. In an example of how the proposed reform would play out differently for different families, Teodoro would have to wait at least five years to secure citizenship, a shorter route than most because she was a child when brought here. Once those five years pass, she would then be able to petition for her deported family's return. The entire process for a family reunification could realistically take as long as seven years, especially if further militarization of the border would have to be planned in writing before any reforms take effect, she said. Add in how her mother was deported six years ago, and 13 years would pass before the Teodoro family could share an American home again. Her example is how the overhaul of America's massive illegal immigration may be measured -- by a half or full generation of time. The last major reform was 27 years ago. And Teodoro said she can wait seven more years, if she must, for her family to be reunited. It's the price of the American dream, she said. "It's very hard for me to think about the numbers, but at the same time it makes me happy that I haven't given up, and I continue to fight for what I believe in, and when we win, it will feel good," Teodoro said. This month, Teodoro and two other undocumented immigrants brought over as children saw their mothers for the first time in years during a brief and emotional reunion at the U.S.-Mexico border. The only thing separating mother and child was an 18-foot border fence, a stark reminder of how Teodoro's deported mother now cannot re-enter the United States for 10 years, a ban shared by the two other moms. As if for the first time in their lives, they touched each other's faces and hair, their arms groping through the slats. "Why? I just ask why? 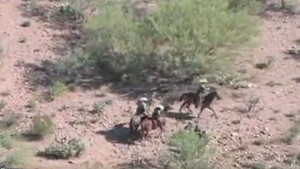 I just want to be with my kids," said Teodoro's mother, Gorete, who took three planes and two buses over 48 hours to travel from Brazil to the Nogales, Mexico, fence. "I lived in America in Boston for 15 years -- why deport me? I clean house for them." Gorete Teodoro illegally crossed the border at Tijuana, Mexico, in 1993, with her three children to join their father who arrived earlier. 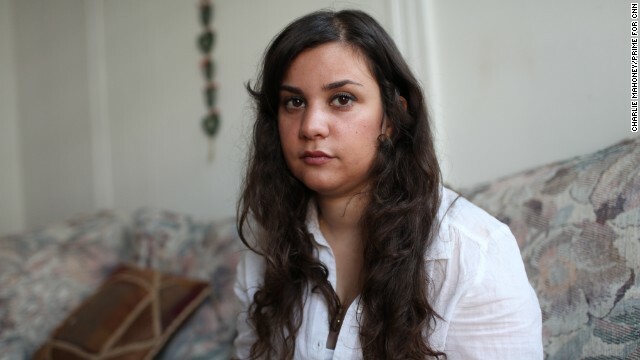 The parents separated after her father was denied U.S. asylum in 2001. In 2007, immigration agents arrested her son at the family's Boston house and then deported him. During that arrest, authorities found Gorete Teodoro's Brazilian passport in the home and threatened to return for her. 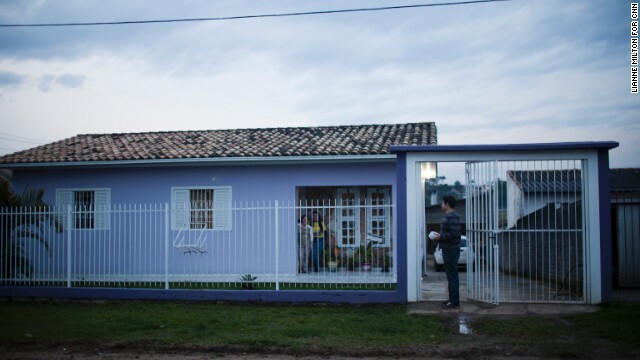 She surrendered to authorities and was deported, taking the youngest of her three children with her to Criciuma, Brazil. That left her daughter Renata Teodoro alone in Boston, working and attending college, despite her mother's pleas to give it all up. Renata Teodoro's two friends at the border reunion also have deferred status: Carlos Padilla, 21, of Seattle and Evelyn Rivera, 24, of Altamonte Springs, Florida, near Orlando. All three are part of a movement called United We Dream, the nation's first and largest immigrant youth-led network advocating reforms. Though they share similar passions about reform, an overhaul of the U.S. immigration system would change their lives in different ways. 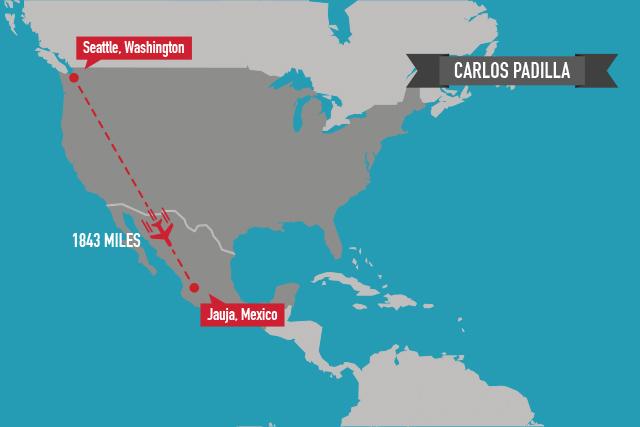 If it weren't for an illness in his mother's family in Mexico, Padilla would now be enjoying the company of both his parents in the United States, though they are divorced. Padilla's parents, brother, and sister -- his entire family -- were all living in the United States as undocumented immigrants. But in 2008, his mother voluntarily decided to return to Mexico to care for her father. If she hadn't left the United States, she stood to enjoy the same benefits of reform as her ex-husband, with whom Padilla now lives. For now, her three adult children in the United States accept a long-distance relationship with their mother. Under reform, Padilla -- like Teodoro -- would be eligible for both residency and citizenship in five years because the two are among the 2 million young undocumented immigrants brought to the United States before age 16 by their parents. Upon becoming a citizen in five years, Padilla could petition for his deported mother to return to the United States. His father, however, would face a citizenship path more than twice as long: 13 years. In fact, the vast majority of reform's 11 million beneficiaries -- those who arrived before December 2011 -- would take the same course. During that 13-year journey, these undocumented immigrants would experience a profound change in identity: They would officially cease being "illegal immigrants" and would become "registered provisional immigrants," or RPI. That new status would bring Padilla's father out of the shadows of society, no longer living in fear of police, arrest and deportation. The 13-year path calls for 10 years as a registered provisional immigrant, then three years of holding a green card, or legal residence. After that, they are eligible for citizenship. 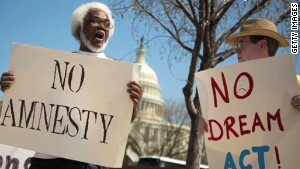 Along the way, an undocumented immigrant would pay a total of $2,000 in fines. And the path requires a steady work history, no criminal record and a constant presence in the country. In sum, Padilla would become a citizen faster than his father would become a green card holder. That, in turn, would allow a faster path for the son to petition for his mother's return. The years of separation have been straining, Padilla said. "A lot of our parents have been deported, and it's hard," said Padilla, whose mother was denied a visa to re-enter the country because officials found she had a U.S. bank account, flagging a prior illegal entry. "Our parents are back in the country where we were born, and they might die because of an accident or any health problems. "They might not be there tomorrow," he added. To overcome depression, his mother has started three small businesses in Jauja outside Guadalajara, Mexico -- carpentry, food and clothing stores -- just to keep busy. His grandfather's heart condition has improved, and now his mother has no relatives needing care, Padilla said. Seeing his mother this month -- the first time in five years -- was overwhelming, he said. "We just ran to them and cried for 10 to 15 minutes of complete silence," Padilla said. Then "we laughed a lot," he said. But they all wondered when they would be able to see each other in person again. Five years? Seven years? Longer? Many family milestones can occur in that time: graduations, engagements, marriages and possibly births of grandchildren. Shortly after the border fence reunion, one of those moments arrived in the family of Evelyn Rivera, who, joining Padilla and Tedoro, saw her mother for the first time in six years. Yolanda Rave couldn't make it to her the wedding of her eldest daughter, Pamela, this month in Miami. Instead, Rave was in Colombia, where she's been living since 2007 when she was deported from the United States following a traffic stop. She didn't have a driver's license at the time, and then police discovered she was in the country illegally after overstaying a tourist visa for several years. Thanks to technology, however, Rave, 53, witnessed her daughter's wedding through a livestream connection over another daughter's smartphone. Rivera said her mother even cried during the reception speeches that she heard on her end. When family photos were taken, someone held up the phone streaming in the video of the mother. "So my mom technically was in the family photo," Rivera said of her sister's wedding. 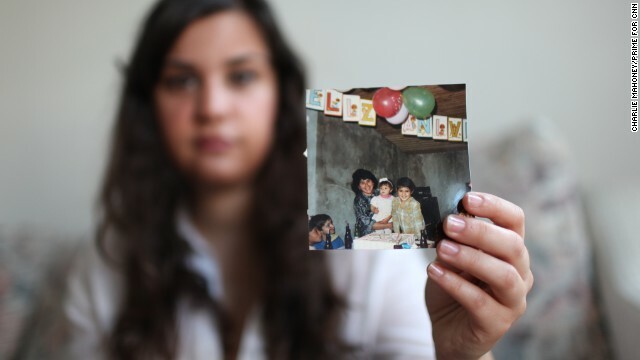 That is how families torn apart by deportation share a major life event. 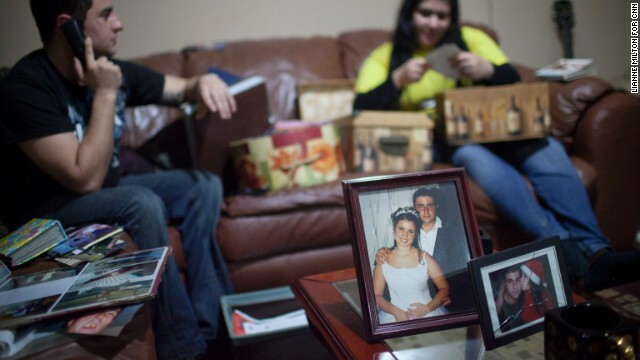 The wedding took place 10 days after Rivera and her mother reunited at the border fence. If proposed reforms go through, Rivera -- unlike Padilla and Teodoro -- wouldn't have to wait long to reunite permanently with her mother. A reunion would almost be immediate. The reason is because Rivera comes from "a mixed status family," as she calls it: Her older sister was born in the United States and, as a citizen, she would be able to petition immediately for her mother's return -- not having to wait at least five years -- if reforms are approved. Rivera's parents are from Medellin, Colombia. They left Colombia amid the 1980s drug violence and came to the United States, where they gave birth to their oldest daughter, Pamela, now 26. On a subsequent visit to the United States, the parents gave birth to their youngest daughter, Sarah, now 19. 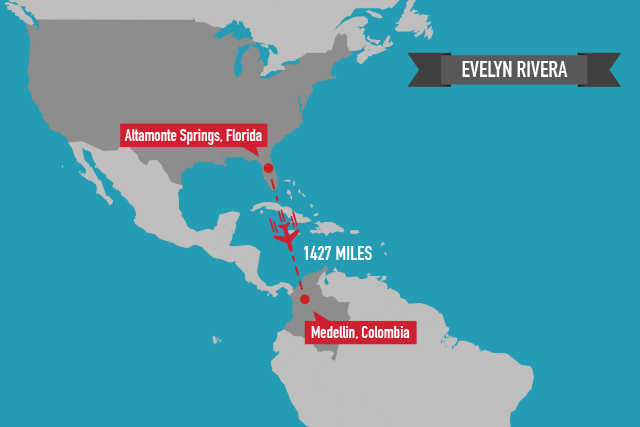 Evelyn Rivera, however, was born in Colombia. But as an undocumented immigrant, she now enjoys deferred status, like Teodoro and Padilla. Her father, who cleans office buildings at night, became a legal resident after his wife's deportation and would also be able to petition immediately for his wife's return, if the reform is approved. Rivera, now 24, said she believes that all undocumented immigrants should have a similar right to reunite immediately under proposed reforms. "For me, when I think about it, I'm very excited to know that my mom can come," Rivera said. "But for me internally, it's hard to know that my friends Carlos and Renata don't have the same opportunity." For them, there could mean more lost family moments, such as when Rivera's mother missed her high school graduation. "It's a very bittersweet immigration law we're looking at," Rivera said.